Inspiration is everything when it comes to design, and that’s why we like showcasing some of the best mobile app homepage designs on occasion. We at iBuildapp have tons of wonderful users who either design their own apps from scratch or they grab a template from the library and modify it to reach their own branding goals. Regardless of which route you take, looking at other mobile app homepage design can expedite the design process and help you feel good about the choices you make. Five gorgeous apps stood out to me while writing this article, and they all have one thing in common: The mobile app homepage designs are attention grabbing and completely unique. 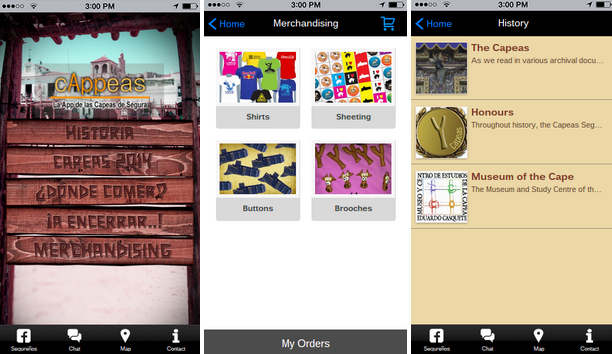 Therefore, let’s take a look at some beautiful mobile apps with cool home pages. We’ve noticed that many schools on iBuildApp take great pride in building an app that looks good and works for parents, students and faculty. 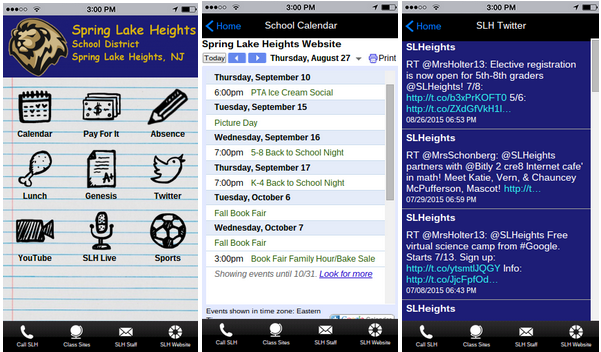 For example, the Spring Lake Heights High School District provides a relevant notepad/paper background, along with icons that look like they’re designed in pencil. The school calendar is accessible as the first icon, and they even keep their Twitter feed updated at all times. 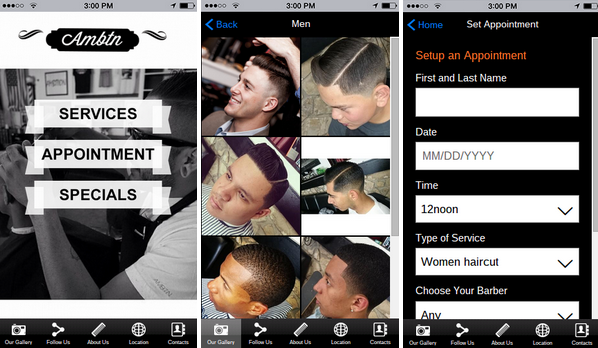 A barbershop is a fairly simple business, but with a mobile app you need a few items. To start, a portfolio of your past customers is essential to show off your skills. Next, an appointment scheduling module is a beautiful way to help customers book that last minute haircut. We enjoy this design since the homepage is black and white and it only sticks to three primary buttons. This tells the customers where they should go first instead of confusing them with maybe five or ten buttons. 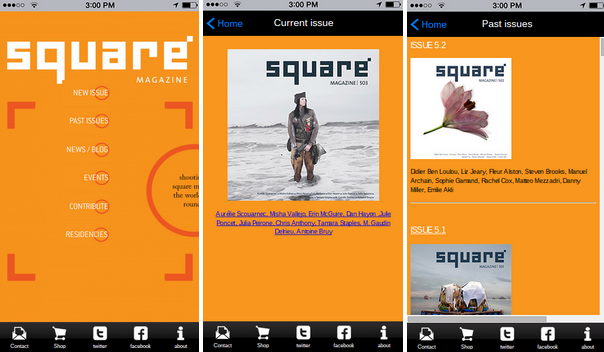 The Square Magazine app does everything right in terms of branding. Each page on the mobile app is colored orange, and it’s difficult to locate a single page that doesn’t have the Square Mag logo. The Mobile App Homepage is my favorite part, since the background doesn’t take away from the buttons at all. You have a clean design with six buttons for looking at the most important elements of the magazine. The Issue buttons are located at the top, and when you click through those links, the issues are available in list format. This is the official app for the Capeas de Segura event, which is a bullfighting event located in Leon. The Mobile App Homepage serves as a beautiful start to the app, since the background is the venue in which the event is held. You can see the stunning building in the back, and the wooden buttons tie into the theme. The app is completely functional with history lessons, a shopping cart to buy merchandise and various videos and photos for learning what the event is all about. You can even find travel tips and contact information if you’re a tourist. 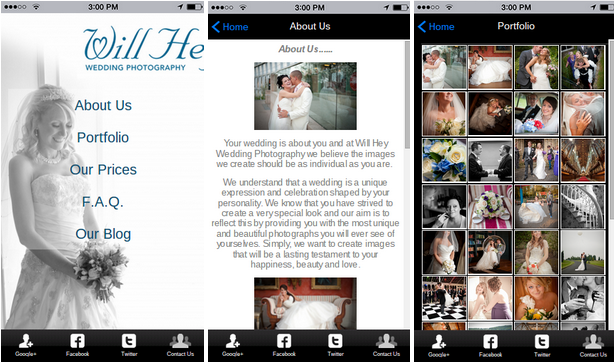 The Will Hey Wedding PHotography app is the quintessential design for anyone looking to build a portfolio app. The homepage has a white, minimalist layout, allowing for the buttons to pop and the background image to look nice. The About Us page is littered with images, showing happy couples in the past and even a few testimonials to push other couples to hire the photographer for future weddings. Finally, the portfolio page is the moneymaker, since it’s packed with high resolution images, and you can quickly scroll through them all to see if you like the photographer’s style. Two big thumbs up for this mobile app. What do you think about these Mobile App Homepage designs? Is it possible for you to construct similar designs for your own apps? We recommend going to the iBuildApp template library if you don’t have app design experience. This way, you can take a professionally built template and tweak minor areas to make it your own. If you have any questions about these gorgeous mobile apps, drop a line in the comments section below.